The HP OfficeJet Pro 8500 is the latest incarnation of HP’s all-in-one printer, scanner, copier, and fax machine. With an original price of $499, it’s close to the cost of a lower-end color laser printer. However, they have recently reduced the price to $369 using an instant savings of $130. You can check the latest price here. You can also get it on Amazon.com for a lower $229. For those of you who do not want to read the entire review, I have written up a short summary of the positives and negatives of the printer. When copying documents, the printer routinely skips pages altogether. This happens when faxing too. Overall, I would give the printer a 3 star rating and a buy recommendation only if you get it for $269. It’s a good printer, but some of the flaws that it has are big enough to consider another printer unless fixed. Getting the Officejet 8500 Pro out of the box and working wasn’t as fast as I would have expected. Unpacking the printer was easy enough and installing all the components, such as the double-sided printer accessory and the second paper tray, were simple and straightforward. Installing the ink cartridges was also fairly simple and didn’t take much time. Just unpack and pop them into the slots. Though it did take a few tries to get the printheads into the slots exactly (top picture). Once you get those installed, you load up the paper and plug in the printer. This is where the process got very time-consuming. When you power on the device the first time, it takes a whopping 20 to 25 minutes to calibrate and align itself. Personally, I don’t think you should really have to wait that long for a printer to become functional! Either way, while you wait it says to go ahead and install the printer software. I was really not happy with the installation of the HP software. Firstly, it took almost half an hour to install the software and secondly, it was full of lots of programs that I did not really think I was going to use. Overall, if you install the software using the default options, it takes up a whopping 600 to 800 MB on your computer! For me, that is completely unnecessary for an all-in-one printer. If you install just the driver, it’ll still hit you back 270 MB. The software has become very bloated and will slow down your machine. What I was happy about was getting the printer onto the wireless network. You can do it from the front panel on the printer and it was able to connect to my secure wireless network without any issues. Also, once it’s connected, the software will try to find the printer on the network automatically and initialize it. That also didn’t have any issues, i.e. firewall problems, etc. Once the setup is finished, you’ll be presented with a menu where you can setup other additional features of the printer, such as Digital Filing, Digital Fax, and more. Once they are setup, you can email scans or scan directly to a network location. Unfortunately, the speed of the printer is not as fast as I was expecting. Overall, though, it’s still pretty fast for an inkjet printer. I printed out a 5 page document with just text and it took about 35 seconds to print. This translates into about 9 ppm, which is lower than the 19 ppm it is supposed to be able to print on normal mode. If you print a longer document, the printing speed does go up a little to around 11 ppm. For color documents, it’s also lower than stated on the spec sheet, but this could be due to the type of color print tested. Finally, double-sided printing is slow at around 3 ppm. If you’re looking to do a lot of double-sided printing, you will not be happy with this speed. Overall, I was happy with the scan quality and speed of the Officejet 8500 Pro. You can choose to scan to email, scan to computer, scan to a USB stick or memory card, or scan to reprint. The Officejet did a very good job or reproducing pictures and even text documents when scanned. Colors were accurate and the quality was overall very nice. Scanning was probably the one feature of the all-in-one printer that worked very well and as advertised. Both of these functions would have perfect scores if it were not for the fact that they simply did not work sometimes. After testing several times, I found that the copier routinely missed pages while copying. If I placed a 5 page document to be copied, just about every single time, only 4 pages would get copied. That is simply unacceptable for such a high-end printer, especially one that is geared towards small offices. This same issue happens when faxing, which is just terrible since your clients may not get all the pages required. The other major issue is that the printer thinks it copied/faxed everything, when it really didn’t! Big problem there. 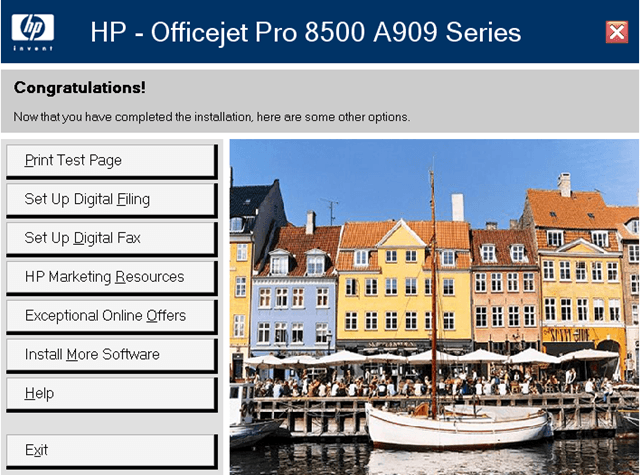 My general feeling is that the HP Officejet 8500 Pro is a very good all-in-one printer, but because of a few big flaws, it fails to make the mark. Overall, you will be happy with the printer as long as you have a really fast computer with lots of free hard drive space and you manage to get a printer that does not skip pages when copying and faxing. If you have an Officejet 8500 and have something to add about your experience, feel free to add it in the comments!